Start a new conversation with the world with the amazing range of Telephone Cables by the house of V-Guard the name which already has become the talk of the town. Made of solid annealed, high conductivity bare copper with special grade high-density polyethylene, V-Guard twisted paired cables are hailed for their superior performance and better recognition. These special cables are fire retardant as they are manufactured using polyester-taped and High Thermal Stability jacketing PVC that is specially formulated with high-oxygen and temperature index. Made to minimize cross talk through their insulated cores and Designated Lay values pairs, V-Guard cables are made to go through stringent quality control tests right from the raw material stage to the final product. 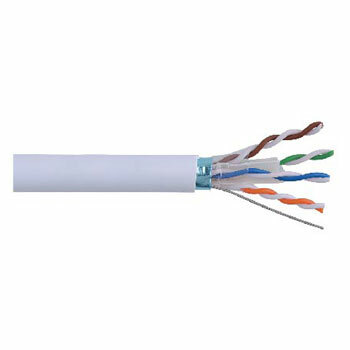 Designed to resist tear and abrasion, V-Guard telephone cables also ensures usage longevity. The reason why these are the first choice for builders from all over India for integration into telephone and switchboard cabling across high rise apartments, commercial hubs, manufacturing units, luxurious hotels and residential complexes. Packing: Available in 90 meter packed in carton and 500 meter packed in easy pull box.